Bee colonies are declining and it’s become something of a real concern to some people. 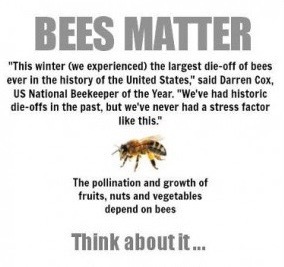 This can have irreversible consequences for our food production, as without pollination plants are unable to reproduce. This is so severe that scientist are warning of the irreversible damages. You might wonder what event has taken place to lead to such a catastrophe. Morgan Freeman in an interview with Larry King stated that he believes that Monsanto the manufacturer of the popular pesticide Glycophosphate marketed as Roundup is responsible. He believes that the government has not sufficiently enforced laws that preserve our environment and the contributions of Monsanto chemicals are destroying the bee colonies. As a result, Morgan Freeman has taken matters into his own hands and started his own bee farm! Another reason to love this talented actor!